Bareboats of various make and model available for hire from one week to two months on either private or flotilla basis. 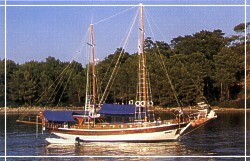 The classic Gulet, best known for its rounded aft, low-to-the-water profile and roomy hull, was once used by fisherman and sponge divers to transport their catch. These days, Gulets are associated primarily with charter and various designs have emerged, all of which come under the collective description of wooden Gulet. The original Gulet has the rounded aft, but as this design limits the number of cabins which can be built in, the Ayna K�c (flat-backed) style of Gulet is becoming increasingly popular as a charter vessel. The double-ended traditional Tirhandil is the oldest style of vessel on the Aegean Sea. Tirhandils are rarer these days due to their accommodation capacity  the design allows for only a small number of cabins. Tirhandils sail well and are an attractive vessel with plenty of deck space. Gulet cabins are popular as they are all about the same size, and each one has either a double berth, or a double berth lower and a single upper (bunk-berths). Every cabin has a wardrobe for hanging clothes and a number of drawers. There is also room for stowing bags and bulky items. Most cabins have their own ensuite bathroom with a pull-out shower hose attached at the basin. The living areas on a Gulet consist of an indoors saloon (some have an encloseable aft area instead), an aft deck for dining and lounging in the shade of a sun awning and a forward deck with numerous sunbeds which can be shaded by a canopy when the yacht is not sailing. The ladder for getting into and out of the water can be of the type shown in the picture below, or on smaller yachts, can be a straight ladder which descends under the surface of the water. There are also numerous yachts with aft swimming platforms. All yachts have a tender with either oars or an outboard engine. Those yachts that offer optional water-skiing have a powerful out- board engine, while the outboards of others are designed purely for getting to shore and back. All yachts are equipped for safety, have a VHF radio, a stereo cassette player and a selection of cassettes. Many of the newer vessels have a cellular telephone, a TV, a video player and a CD player. A yachts galley is always well equipped and the cook takes pride in creating tempting dishes of Turkish and international origin. You will be expected to fill in a "preference sheet" to list what types of food you like to eat, whether you have any allergies and if you have any special dietary requirements. The cook will then try to fulfil your requirements as far as possible  although in Turkey, some ingredients are just not available. Just as you will let your cook know what appeals to you in the way of food, you are wise to let your captain know what interests you ashore. His expert advice will enable you to come up with a satisfying itinerary with all the right ingredients. The electricity of most yachts runs at 12 V / 24 V. Please consider this if you wish to bring battery-operated or electric shavers, videos, portable PCs, etc. You are welcome to bring your hairdryer too, but the best way to dry hair in these parts is the natural way  under the sun! If snorkeling is one of your favorite pastimes, we suggest you pack your own set of gear, then you wont need to adjust the mask size every time you wish to explore the depths. The yachts pictured on the following pages exemplify vessels of their type. This selection represents only a small number of the yachts available for charter. From our three-cabin yacht CARETTA CARETTA, up to the GLORIA, offering twelve cabins, we are able to provide you with many alternatives. We can advise you as to the different sizes and types which will best suit your particular requirements.Click on the below names to get to know these beautiful yatches.